If the backside of the daughter board is marked with the GaN System’s logo, you have an earlier version, the GS66508T-EVBDB, which is covered by this set of documents. 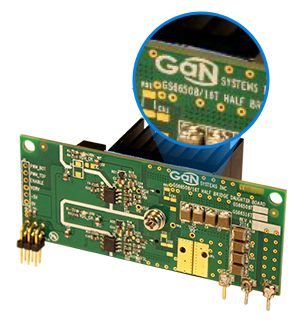 The GS66504B-EVBDB daughter board consists of two GaN Systems 650V GaN Enhancement-mode HEMTs (part number GS66504B) and all necessary circuits including half bridge gate drivers, isolated power supplies and optional heatsink to form a functional half bridge power stage. 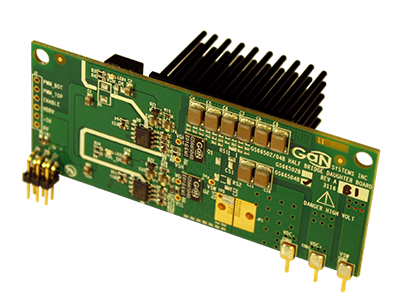 It allows users to easily evaluate the GaN E-HEMT performance in any half bridge-based topology, either with the universal motherboard or the users’ own system design.